How Much Superannuation Should You Have at Your Age? We all want to live a comfortable life in our retirement. In 1992, compulsory superannuation was introduced to ensure Australians had the financial security they needed in their later years, whilst also reducing the growing burden on the national budget. But with the average life expectancy estimates for Australians increasing every year, knowing how much superannuation you need to retire can be difficult to calculate. A good place to start is to think about the amount of money that we typically spend and break this down into essential needs (such as food, clothing, utilities), preferences (such as holidays, travel, eating out frequently) and nice to haves (such as a boat or holiday home). 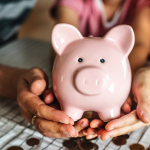 It’s often been mentioned that $1 million or more in superannuation savings is needed to live a comfortable retirement, however, most Australians will have far less than this in superannuation when they retire. So how much do I really need in superannuation? As a rough guide, ASFA (Association of Superannuation Funds Australia) has taken into consideration the potential living expenses, excluding rental costs and calculated two retirement categories – ‘Comfortable’ and ‘Modest’. Source: ASFA Retirement Standard – December Quarter 2016. All figures in today’s dollars using 2.75% AWE as a deflator and an assumed investment earning rate of 6 per cent. They are based on the means test for the Age Pension in effect from 1 January 2017. What is the difference between a modest and comfortable lifestyle? Source: ASFA Retirement Standard – December Quarter 2016. 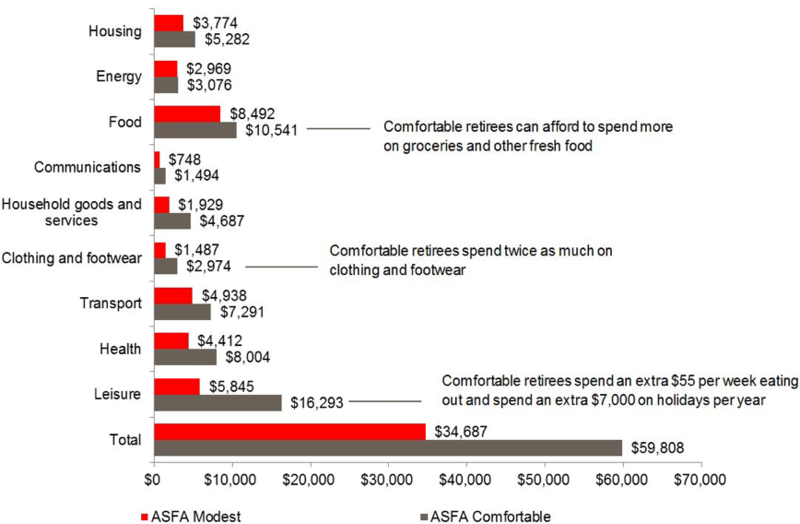 As can be seen, the comfortable retiree generally spends more on food, household goods, services and clothing (as they are able to afford a little more luxury). The biggest difference between the two lifestyles is the amount spent on leisure (i.e. holidays and entertainment). The age pension makes it possible for a couple who retire with only $35,000 in superannuation to still spend the “modest” $35,687 a year. 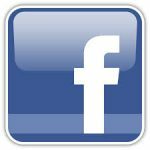 Currently the full annual Age Pension is approx. $23,590 for an individual and $35,570 for a couple. As you can see, if you include the Age Pension in your calculations, the retirement savings needed for a modest lifestyle become much less daunting. If you combine the full pension, with additional superannuation savings, for example a couple that has $100,000 each in superannuation, the additional payments could help move a couple from a modest lifestyle to being almost 50% closer to a comfortable lifestyle according to the ASFA Retirement Standards. Please note the Age Pension is both asset and income tested. As such an individual or couple will receive reduced payments or cease to be entitled where they have assets or income over a certain threshold. How does my superannuation balance compare to the average balance of Australians? The Australian Bureau of Statistics in 2016 published figures showing the average superannuation balance of Australians by age. The figures show that most Australians at retirement age (60 to 70 years) are well short of the $545,000 (single person) and $640,000 (combined balance for a couple) for a comfortable lifestyle. However, it should be noted that in 2016 when this data was published, those aged 60 may have worked the first 18-20 years without employer superannuation contributions, as compulsory superannuation was only introduced in 1992. The figures also show that even those who have worked their entire life with compulsory superannuation contributions are unlikely to reach a balance of $545,000, without making additional superannuation contributions. How to Boost my Superannuation Balance? If you are concerned with your current super balance, there are ways in which you can boost it. These options are purely advisory and do not constitute professional advice. Once you know how much you have in your super balance, you can take the relevant steps to increase it as required. You and your employer can come to an agreement to contribute an extra percentage of your pre-tax salary to your super balance. When you opt to do this, it is known as salary sacrificing. Not only does this boost your superannuation savings, it also results in reduced personal income tax. Please note that salary sacrificing is most tax effective where your taxable income exceeds $37,000. If you employer does not allow salary sacrifice, from 1 July 2018 you can also make contributions directly to your Fund, and claim a tax deduction when you complete your tax return. You may also deposit money into your super fund (without claiming a tax deduction). This is referred to as non-concessional contributions and differs from concessional contributions due to the fact that you have already paid tax on the deposited funds. Annually the amount of non-concessional contributions an individual can make is capped at $100,000 per annum (assuming your total superannuation balance is less than $1.6 million and you have not triggered the bring forward rule). As with concessional contributions, if you are aged over 65 years, you will need to meet the work test in order to make non-concessional contributions. Assuming an individual is currently 30 years old, has a superannuation balance of $33,000, earns an annual salary of $80,000 and makes no additional contributions to superannuation, at age 65 they will have a superannuation balance of approximately $329,729 1. For this individual to reach a superannuation balance of $545,000 by retirement age (assumed to be 65), they would need to salary sacrifice an additional 8.5% (or $6,800) from their salary annually for the remainder of their working life. The below table provides a snapshot of the additional contributions required at various ages, based on the average superannuation balances from the ABS, to meet the goal of $545,000 in superannuation by retirement age (assumed to be age 65 years) for an individual with an $80,000 per annum salary. While there is no set age for when you should begin saving toward your retirement, the earlier you start the more you can expect to have when the time comes. Calculated using the ASIC Retirement Planner Calculator, using a balanced portfolio prior to retirement and conservative portfolio post retirement with medium fees. For a full set of the assumptions used in this calculator please see – https://www.moneysmart.gov.au/tools-and-resources/calculators-and-apps/retirement-planner. Other options to improve my retirement income? Consider part time work – recent research shows that an increasing number of people want to keep working after they reach retirement age (23% intend to work beyond 70 years).4 While this income helps provide financial security, many also note that it provides personal satisfaction. Also remember that small amounts of super go a long way. For example, a super retirement balance of $100,000 delivers a weekly income of $96 per week over and above the Age Pension (for an approx. 20 year period). That’s 20% more than you would get if you relied solely on the Age Pension5. How to calculate my estimated Super Balance? The ASIC (Australian Securities and Investment Commission) retirement planner is a useful tool to use to calculate your estimated superannuation balance at retirement and the annual pension payment this balance will support once you are retired. You will be asked for various financial information, such as the current balance of your superannuation, your employer contribution percentage and any additional contributions you make. You will also need to supply your current age and your desired retirement age. The entire process only takes 5 minutes. If you would like help and support managing your superannuation and retirement goals, please feel free to contact Sandy Gosper or one of the Partners at Kennedy Barnden. We understand that every individual has their own unique requirements and we are here to help you with all of your financial planning needs. The Russell 10/30/60 Retirement Rule. Russell Investments. July 2015. Retirement and Retirement Intentions, Australia, July 2014 to June 2015. ABS. March 2016. Based on the single age pension and the earnings on $100,000 based on a conservative portfolio and medium fees using the ASIC Account based pension calculator. For further information about the assumptions used in the calculator see – https://www.moneysmart.gov.au/tools-and-resources/calculators-and-apps/account-based-pension-calculator.